Where to Stay in Tulum: Beach or Town? Tulum started as a sleepy beach getaway but today is a hot spot for nightlife, amazing restaurants, and boho chic shopping. If you’re planning a visit to Tulum, you might be overwhelmed with the huge range of accommodation options. There’s everything from luxury resorts to rustic beach side cabanas, and there are actually two separate neighborhoods to Tulum, so it can be a little confusing when figuring out where to stay. 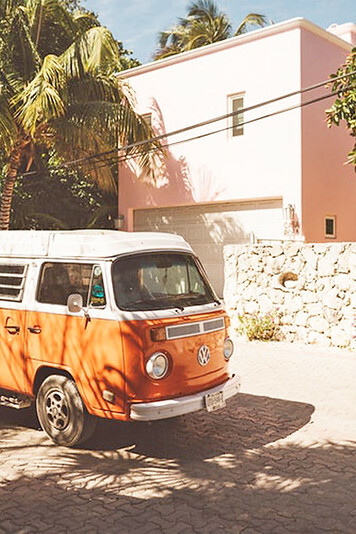 Here’s our Tulum accommodation guide to help you make the most of your trip and decide on the perfect place to stay! Called pueblo by the locals, Tulum Town is the actual village. This is where the locals live and where you’ll find authentic taco stands, souvenir shops and a more authentic, Mexican vibe. There are lots of cute cafes, supermarkets and local restaurants, plus adventure shops who can hook you up for scuba dive trips or adventure activities. Hotels here are affordable and most have pools, but there’s no beach. If you’re visiting Tulum, town makes a great base for day trips to explore the Mayan ruins, Cenotes and Akumal (where you can swim with turtles), as this is where all the transportation picks up and drops off. Tulum town is completely unpretentious and if you don’t mind sacrificing direct beach access, you’ll get a lot more bang for your buck! Called playa by the locals, Tulum Beach is a long strip of pristine sandy coast with gentle waves. This is where the most beautiful resorts are, trendy restaurants and fun nightlife are. The farther south you go on the beach strip, the nicer the beach is (less seawood and smoother sand) and the more upscale the hotels. The way Tulum Beach is laid out, there is one main road and almost all the hotels are located on the eastern side, with beach access. While Tulum’s beach is technically public, each of the resorts carves up their slice of the sand, so you have to essentially be a guest in order to access the beach. So, Where Should You Stay in Tulum? One is more local and authentic, the other trendy and definitely expensive. I’d recommend Tulum Beach if it’s your first time visiting Tulum and you want to lay out on the beach all day, hit a trendy restaurant for dinner, and dance the night away. I’d recommend Tulum Town if you’re on a budget and want to explore cenotes, ruins and have a more active vacation! It’s too far to walk between Tulum Town and Tulum Beach, but you can rent bicycles if you want to explore on your own. This is still a pretty big workout though! The easiest way to get from Town to Beach is with a taxi. Fares are generally set, and you can read my Tulum Travel Guide for more on getting around Tulum, taxi costs and day trips. If you’re visiting Tulum for a week or more, why not split your time? Here’s a quick overview of our recommended Tulum hotels, in both neighborhoods. All of these are known for clean, beautiful rooms and great customer service. Some are luxury, others eco friendly, and some great for groups and budget travelers! Keep reading for more info on each option and why we recommend them. The southern end of Tulum beach has soft white sand, gentle waves and beautiful blue skies. The best, most luxurious resorts are concentrated farther south along the beach strip. There are different types of room options at Coco Tulum: garden view, ocean view, some with shared bathrooms. We recommend the ocean view cabanas so you can fall asleep to the sound of the crashing waves. Coco is one of the most beautifully designed hotels on the beach strip. Everything is white, clean and minimalistic… with a beachy twist! From white canopy beds to seashell sinks, design lovers, couples and honeymooners will love staying here. Don’t miss Coco’s Beach Bar and Beach Club – fun music all day, cute swings and great drinks! Be Tulum is a gorgeous resort that’s most famous for its beach parties. Great people, great music and unforgettable nights! Book one of the rooms with a private pool, hammock and outdoor bath tub to really experience the most. Be Tulum is designed to showcase the jungle and ocean, and there’s no better way to soak it in than from your outdoor shower or plunge pool! This stunning boutique hotel is located on the southern end of the Tulum beach strip. With just 9 bedrooms, you’re guaranteed to experience a beachfront bungalow that’s private, relaxing and blissfully quiet. The resort is decorated with Mexican art and earthy wood touches, part Robinson Crusoe, part Design Museum. Stay here to experience beautiful sunrises, breakfast in bed and cozy turn down service with tons of little tea lights casting a beautiful glow. Eco resorts are very popular in Tulum. You’ve probably seen pictures all over Instagram – these are beautifully designed, with organic wood and earth materials that blend into the surrounding beach and jungle. Rooms are typically open, with soaking tubs that overlook the ocean, canopied white beds and outdoor showers. These are the most popular accommodation to stay in Tulum at the moment! But, make sure you know what you’re signing up for. Eco friendly hotels typically don’t have the best wifi. Some don’t even have 24 hour electricity or hot running water, as they’re environmentally friendly! Rustic and minimalist, the eco-friendly property is made up of cabins facing the beach. Book the cabanas for private patios that open up right on the water for a truly relaxing stay. Papaya Playa is famous for its Saturday Night Full Moon parties with excellent electro music, beach lounge and incredible drinks. For the most part, Tulum is a sleepy, hippie getaway but it comes alive at Papaya Playa! If you want a spiritual retreat in Tulum, there’s nowhere better than Nomade. Stay here for the vegan breakfast, fantastic yoga classes and bungalow style rooms. Nomade is one of the best hotels on Tulum beach and boasts amazing decor, a calming spa and it’s own private slice of the Caribbean. First off – there’s no electricity at Azulik. If that’s not a deal breaker for you, then you’ll love Azulik’s incredible tree hut suites. Raised on platforms high above the beach, you’ll feel like you’re staying in the clouds. Each suite is designed differently, but all feature gorgeous views of the beach, outdoor showers and beautiful decor. Some have their own hot tubs, pools, and patio swings. The on site restaurant is fantastic as well! Of all the hotels in Tulum, Azulik is hands down the most unique place to stay. If you’re looking for something quirky, organic and unforgettable, stay at this Tulum eco hotel. For budget friendly options, head into Tulum town. Prices are cheaper, rooms are clean and you can always head to the beach on your own! Some of the best tacos we’ve ever had were in Tulum’s town. Make sure to visit Antojitos la Chiapaneca – it’s the most famous spot in town that serves tacos al pastor, slow cooked pork shaved off a spit directly onto a tortilla, topped with sliced pineapple. You can find taco shops all over town but the best open only at night. This Airbnb home is compact, but clean, comfortable and filled with light. There’s a private pool in the backyard and a cozy hammock in the front. If it’s your first time in Tulum, the host is more than happy to recommend great swimming holes nearby, accessible beaches and insider tips to make the most of your stay. La Casa Blanca is located in a quiet district in Tulum town, frequented by tourists and expats. It’s a short 5 minute drive to the beach, or 15 minutes walking into town. Best of all? The host provides bicycles so you can cruise around on your own! Located right in Tulum town between the main strip and the bus station, Ginger Tulum offers a great location for an unbeatable price. This budget friendly hotel is small, but offers clean, comfortable rooms with modern decor and air conditioning – something that’s hard to find in many other properties! 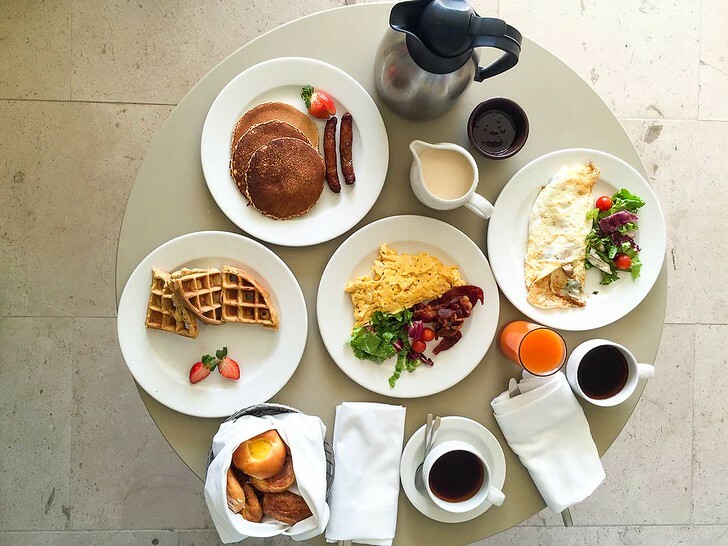 Each room is sized slightly differently, but all include a great made-to-order breakfast and steady wifi. There’s a small pool towards the entrance, but water lovers will probably skip it. Instead, guests access the beautiful beach at sister hotel Coco Tulum, which is located on Tulum’s beach strip. Stay at Ginger Tulum if you’re on a budget but want the best of both worlds! Una Vida is located in a quiet part of Tulum town, with meticulously maintained grounds and beautifully designed rooms. The pool is lit up at night for a magical atmosphere. Plus, there are complimentary bikes should you want to head into town. Rooms are apartment style, with both 2 and 3 bedroom villa options, so families with kids traveling to Tulum will love the extra space and kitchen area! And that’s it! Our guide to Tulum’s best hotels to make the most of your stay. 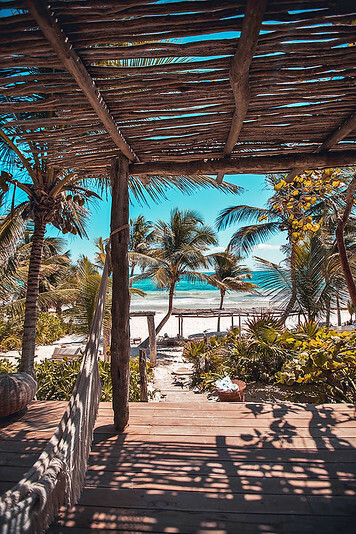 Whether you’re looking for a beautiful suite overlooking the ocean, a rustic bungalow on the beach, or a clean, comfortable hotel in the center of town, these top hotels in Tulum are sure to please. From New York City, you can easily grab inexpensive direct flights to Cancun. From Cancun International Airport, you can rent a car or take the local bus to Tulum, Playa del Carmen and other popular cities. If you’re visiting Puerto Vallarta or Mexico’s West Coast, you may need to transfer in Georgia or Texas if traveling during low season. Check here for flight deals. For hotel bookings, we relied on Booking.com. For more help with planning your vacation to Mexico, we love Lonely Planet’s Mexico guidebook. The local advice for admissions, times, maps and pricing was pretty invaluable. If you plan to scuba dive, kayak or swim – I recommend bringing along a GoPro to take some fun photos! Finally, make sure to visit Mexico with travel insurance. Whether you get injured and need to be hospitalized, or your phone gets stolen, or an injury forces you to cancel all or part of your vacation, travel insurance will help when you need it most. Get a quote for your trip here. So many cool ideas! Planning on going to Tulum soon so I will definitely save this. Question though – I was under the impression that beaches in Mexico are public – can hotels just use them excusively then or is it just a matter of getting to the beach and not walking through a lobby? Hi Annika, hope you’re well! So by law yes all beaches in Mexico are public. In reality… pretty much throughout the country hotels have carved up the best sections of the beach and basically blocked them off. For Tulum, the beach strip is laid out like this: there’s a long narrow road and dense jungle vegetation. hotels and restaurants are set up along the road, but you have to walk through the lobby and rooms for most, in order to reach the beach. if you don’t get stopped, the beach itself is small. most of the sand is taken up by cabanas, lounge chairs, swings, bars etc, that belong to the hotel and are only usable by guests. so it’s very difficult to really enjoy the beach unless you are staying on the hotel strip. © 2019 Sher She Goes|P4 Photo Blog by NetRivet, Inc.